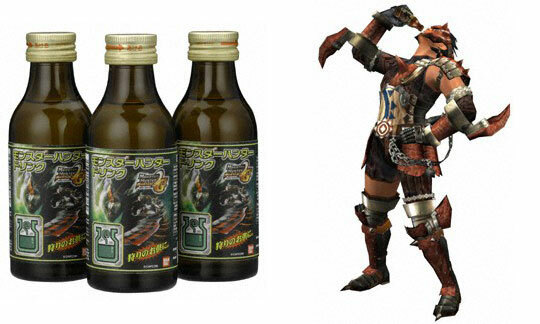 The Monster Hunter series exploded into the RPG genre like wildfire, in Japan at least as well as several communities in the Philippines (PinoyPSP for one). 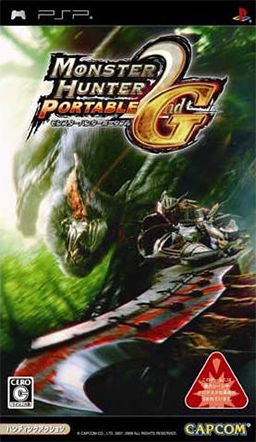 It’s one of (if not) the most successful games on the PSP console (the lastest game, Monster Hunter Portable 2nd G selling 6 million copies in a day) and paved the way for a more social gaming experience on the PSP. Here’s six reasons why you should be playing the Monster Hunter games. With the general RPG scene already dominated by big game names like Crisis Core and God of War, Monster Hunter can be considered as the centerpiece where action takes precedence over the story. Why? Because you’ll spend most of your timing running from or battling monsters instead of worrying with an actual plot. The game is very linear in a sense but considering it’s gameplay, it’s makes the hunting so much more enjoyable. Not only because you don’t have to dig deep to find out what’s going on but you get to focus on doing what you’re supposed to do in-game; killing monsters. While there is a good number of players who love PvP (Player vs Player) type games, PvM (Player vs Monster) games are still the cream of the crop. With regards to it’s gallery of monsters (or monster Index) MH doesn’t disappoint. Each update of the game brings more ferocious and challenging monsters into the fray. Some monsters are related to others like the Daimyo Hermitaur and the Shogun Ceanatur. While they may appear similar (and are related by specie), they’re two very different creatures in terms of attacks, behaviour and item drops. This ensures that gameplay doesn’t get THAT monotonous over time because you’re fighting an upgraded version of a monster you’ve previously defeated. Currently, there’s no PvP for the Monster Hunter series but when the PC version, Monster Hunter Frontier releases (it’s an MMO), things might change. Swords, Spears, Bows and Gun Lances? Every RPG fan has a weapon of choice. A sword, a spear, a scythe, a bow, or a Gun Lance, MH caters to the player’s fancy with a plethora of melee and ranged weapons. This is a quick list. I wanted to do add some descriptions but you’re better off trying them yourselves since I’m only familiar with the Dual Sword, Long Sword and Bows. Cooperative multiplayer is where Monster Hunter shines. Using Ad-Hoc (one of you plays the host to the game and other players can connect to your lobby) you can play with 3 other of your friends to form 4 player hunting parties that can work together to bring tough monsters down. It’s a great way to speed your way through the HR levels and pick up great items for weapon and armor crafting. Ever since Monster Hunter Freedom, the highest Hunter Rank I’ve gotten so far is HR 3 and the quests available to you at that level are already filled with monsters that’ll give you a run for your money. What makes it fun (albeit repetitive) is that you have to understand the creature you are fighting in order to conquer it. Strategy is the core of MH gaming. Even if you’re equipped with the best equipment around, mess around and you’ll likely to use up all your consumables and still be knocked unconscious or worse fail the mission. The stronger the monster, the more preparation. If you’ve started out the Monster Hunter series with Monster Hunter Freedom, don’t fret. Monster Hunter games allow you to import your character from an older version of the game into the new one (although you can export it back). The earlier import system from MHF to MHF2 stripped your character of your equipment (but all your other items are still there). In MHF2 to MHP2G, you get your character as is, with minor stat adjustments so you don’t have to start over. 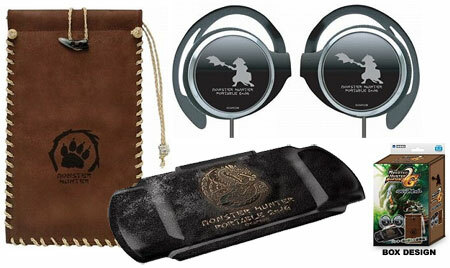 Monster Hunter Portable 2nd G Bundle. Felyne next to Village Elder, giving out G rank quests. New subspecies: Red Shogun Ceanataur, Green Congalala, and Desert Blangonga. New area: the Sea of Trees. 1st Generation maps of Jungle, Volcano, Desert and Swamp added. Third quest giver wearing yellow in Guild. Eight equipment pages instead of six, and possible extend to 10. Forest and Hills quests can now be at night. G-rank quests are back and harder than ever. Fighting 2 or more different boss monsters is a must in some G-rank quests. Dual Swords may now have two separate elements (example: one fire sword and one ice sword). Hunting Horns have a new note that works like a Sonic Bomb. Crag shots of Bowguns to the head can KO monsters (like Hammers and Hunting Horns). New Sharpness superior to white: purple. Frequency of Use of Weapon Types. Recording of your recent activity. New sphere superior to Heavy Armor Sphere: King Armor Sphere. New Gunlance-only quest against the Kushala Daora in the Snowy Mountains. You can now hold up to 99 of each item type in your box. You can now store up to 20 equipment sets. Felyne Whim Skill – “Felyne Dance”. Extra gathering spot for bug catching and ore mining featuring new Ores and Insects. Buy your items and send it to the Item Box. Directly combine items inside the Item Box. Media Install System that speeds up loading times. Some weapons get further improvements. Skip animation scenes with SELECT. Trenya can be sent to the Sea Of Trees. Treasure Quests can be played at the Sea Of Trees. 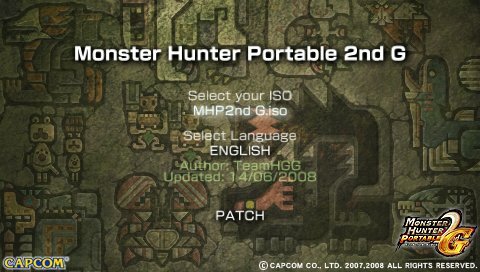 How do I get Monster Hunter Portable 2nd G? You can buy the game now or download it from psp games download sites but unless you know Japanese, you won’t be able to play it. Luckily, the ingenious people from the Homebrew community were able to create a patch to change the language (for the ISO only, if you have the original game on a UMD you can’t do this) of the game into any language you want. You can download the Language Patcher here version 2.7. Note that not 100% of the game has been translated. But even with the incomplete translation, it’s quite playable. I’ll edit this post for more information on the game. In the mean time, lets meet up via Xlink Kai. i want download game from this website but i don’t know can somebody teach me plz…….. I get the message “The game could not be started. (80020148)”, when I try to run the patch. Any ideas what I am doing incorrectly? can i ask? why is that t when i run the patch there is no iso to choose from?? are you seeing any ISO at all? It maybe that you put papimeru on the wrong directory. bat gnun d b cso ung monster hunter portable 2nd g?? ksi pag ngpatch ako walng iso ung monster hunter..pnu to? hmmm napeplay mo ung papimeru pero wala ung ISO ng MH? Tama ba? ah.. CSO nga pala ung monster Hunter na naupload ko… just decompress it to ISO tapos lagay mo uli sa memory card mo. Makikita na ng Papimeru yan…. Edit ko na lang ung steps. yoh syl! ok n nlalaro ko ung monster hunter well ofcourse tnx for ur help men! i really appreciate it!! piz men..
no prob… dali lang di ba? Try to use the search button next time: Monster Hunter Portable 2nd G.
What version would you recommend I get that’s in English? I’m happy to wait if the latest version will be translated some time this year. you can get the Japanese version (P2G) now, it’s english patched. The great thing about Monster Hunter is that your Japanese save game can be converted into English within 5 minutes. P.S. Would it be worth getting MHF2 to play while I wait for unite to come out, so I can transfer my character over? yep. although I’ll still recommend P2G to spare you from the frustrations of Freedom 2’s system. Got Monster Hunter Freedom 2 last Thursday and I’m really loving it so far. The combat was a bit difficult at first, but now I seem to have the hang of it. I went Hammer for KO’s and thats really helped me out with some boss fights. I’m also loving my spiffy new giaprey armour. No one I know has a PSP. Maybe I’ll be lucky and Unite will have infra-structure instead of just ad-hoc. You should totally come to Sydney just to play MH with me. XD kidding. there’s xlink kai for that.. btw, I’ll explain it on an upcoming post. i like monster hunter portable 2nd g its challenging,intensing,hard and goo grapics,animations coz’ im a hunter in MH portable 2g i was already strong i already have a mission of a kushala daora(kushala daora is an elder dragon not a wyvern) and close to the urgent mission of the tigrex but the save file i used to play with was corrupted but i started it again and close to the blangonga!!!!!!!!……….. can we delete the language patch on our psp once we finish?? um sir silverblade may bago po bang english patch ng MHP2ndG ung nsa link nyo po ay 2.0 at hindi pa nga sya 100%^_^ at alam mo po ba kung saan pede mag download ng mga quest? For the quests, try mo lang magonline via wifi. Nakadl kami ng quests without any problems.